Disposing of oil used for fish and chips or fried chicken is never simple. Pouring it down the drain can clog plumbing and sewage systems. 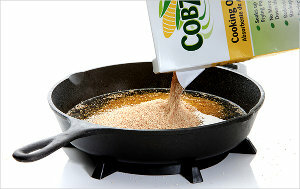 But CobZorb, a grainy, biodegradable new product made from corn, will soak up the grease. It can be stirred into fat that has cooled to room temperature, and then tossed into the trash like kitty litter.